2004 has proven to be a year of excellent growth for Reliable Controls. Sales have increased 42% over 2003. 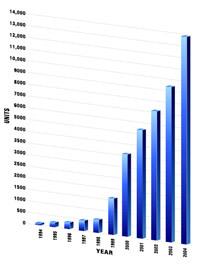 Shipments of microprocessor-based products averaged over 1,000 units per month throughout the year. Growth was better than expected in all regions with Eastern USA and Eastern Canada showing exceptionally strong sales. Thank you for making 2004 another great year! 2004 DEVELOPMENTS - Continuous product development and new product releases highlighted the year for Reliable Controls. RC-Studio 2.0 was released with an updated look and a new feature-set that includes BACnet® support and animation. After gathering a host of recommendations from our Dealer Network, the SMART-Sensor LCD was developed and released. New SNMP and BACnet® functionality was added to the ETHER-Link™ and MACH-Global, both of which have been submitted to the BACnet® Testing Labs. 2004 also saw the development and release of the MACH-Air™ Halomo, a significant improvement to the motor design of the controller. There were also improvements made to our line of software products, such as the audit trail feature in RC-WebView and BBMD and SNMP in RC-Toolkit. Key decisions were made and development undertaken on the next generation of controllers, code-named Pyramid. Perhaps the single largest development in 2004 was the purchase and renovation of our new facilities. With the move to our new location in October of 2004, we will all benefit from streamlined processes and space to grow.